What Is an AIR File? A file with the .AIR file extension is most likely an AIR (Adobe Integrated Runtime) Installer Package file that stores internet-based applications programmed using Adobe Flash, ActionScript, or Apache Flex. 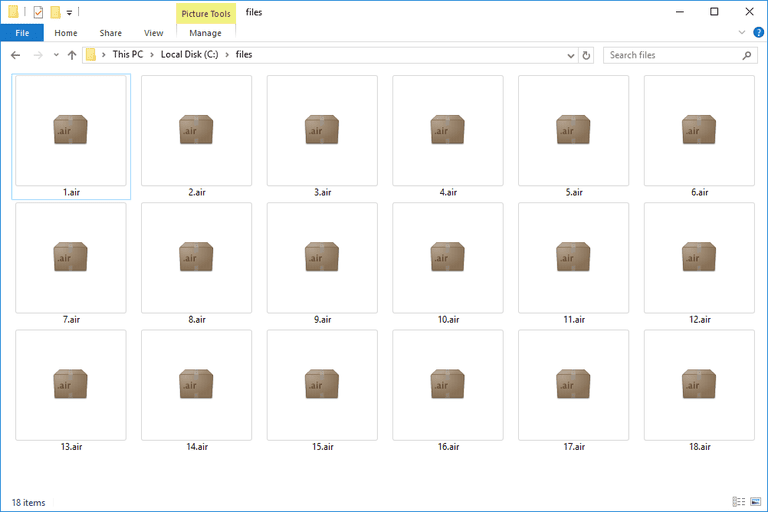 AIR files are usually ZIP-compressed and can be used across all desktop and mobile operating systems that support the Adobe AIR runtime, like Windows, macOS, Android, iOS, and BlackBerry Tablet OS. The M.U.G.E.N. video game engine uses the AIR file extension as a plain text file that stores animation settings. It may explain how a character should move or how a background scene should simulate movement. They also explain how M.U.G.E.N. Sprite files (.SFF) are animated. AIR is also an acronym for Automated Image Registration. Since some Adobe AIR files are ZIP-based files, you should be able to pull it apart using PeaZip, 7-Zip, or any other free zip/unzip programs. However, to have full access to the original application files, a decompiler may be necessary. Take great care when opening executable file formats like .AIR files that you have received via email or downloaded from websites you're not familiar with. See our List of Executable File Extensions for a listing of file extensions to avoid and why. To actually use .AIR files on your computer, you need to install an environment for them to run in, which is done through the free Adobe AIR. This is a prerequisite before you can use the AIR application. After it's installed, the application will run like any other software program or video game. AIR applications can be built using Adobe Animate (previously called Adobe Flash Professional). For more information on using AIR applications on a desktop, Android, BlackBerry Tablet OS, and iOS devices, see Adobe's Packaging Adobe AIR Applications. M.U.G.E.N. Animation files are used with Elecbyte's M.U.G.E.N. You can edit one or view the text settings inside with a text editor like the Notepad program built-in to Windows. However, if you want something more advanced, or a program that can open AIR text files on a Mac, see our Best Free Text Editors list for our favorites. If you have an AIR file that's associated with Automated Image Registration files, you should be able to open it with the program suite by the same name. See Adobe's article on packing a desktop native installer to learn how you can make an EXE, DMG, DEB, or RPM installer file from an AIR application using AIR Developer Tool (ADT). Converting the AIR file to one of these formats means the application can be opened even if the Adobe AIR runtime isn't installed. APK files are Android Package files. Adobe has information on creating Android APK packages if you're interested in doing that. To create client-side PDF files from an AIR application using AlivePDF, see this tutorial from Murray Hopkins. I don't see any reason why you'd want to convert M.U.G.E.N. Animation files to any other format because doing so would make them stop working with M.U.G.E.N. However, since they're just text files, they technically can be converted to other text-based formats like HTML and TXT, with most text editors. If any program can convert an Automated Image Registration AIR file, it's going to be the program I mentioned above. Some file formats use a file extension that closely resembles a suffix used for other file formats. For example, even though an ARI file looks an awful lot like an AIR file, the two are not related at all. ARI files are ARRIRAW Image files captured by ARRI digital cameras, and are opened with an image viewer/editor like Adobe Photoshop. Other ARI files are archives compressed with algorithms like PPM or LZP. Neither of these file formats work in the same way that AIR files do. This same mistake could be made with any file format that uses a file extension that's spelled like .AIR. If you're not dealing with an AIR file, be sure to research the true file extension so that you can find out which programs are able to open your specific file.